A network of telephone support and cross-trained service technicians is ready 24/7 to keep your printing business running smoothly and profitably. Our certified service professionals are committed to your success - from installation and training; to hardware and software upgrades; to effective routine preventive maintenance; and emergency break-down solutions. 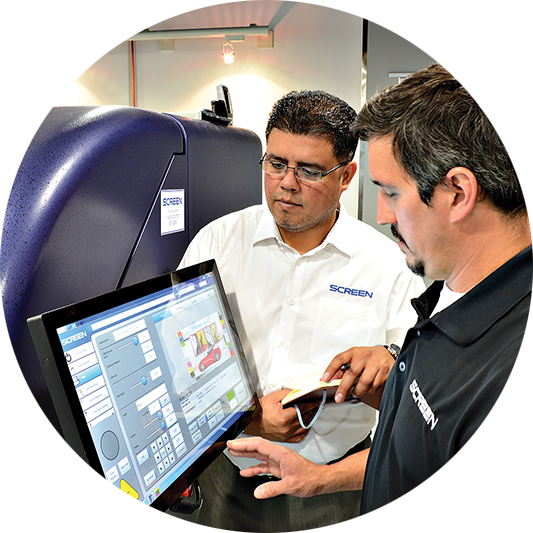 Screen equipment has a reputation for reliability that is second to none and by providing first class service Screen ensures that it retains its market leader status with equipment that has the highest up-time and lowest maintenance costs. + 44 (0) 1582 725400 Call back within one hour during office hours. Call back within one hour during office hours. A range of Screen Sure Agreements are available and can be tailored to meet the individual needs of our customers. This service comes standard during the warranty period on every Screen machine, and is included with all Screen Sure Service agreements. TRUST Assist: Remote service that provides maintenance and recovery of a system as well as operational support and guidance. TRUST Guard: Helps prevent problems before they occur through early detection and diagnosis. TRUST Dialog: Exclusive cloud-based portal site designed to provide comprehensive maintenance service materials. 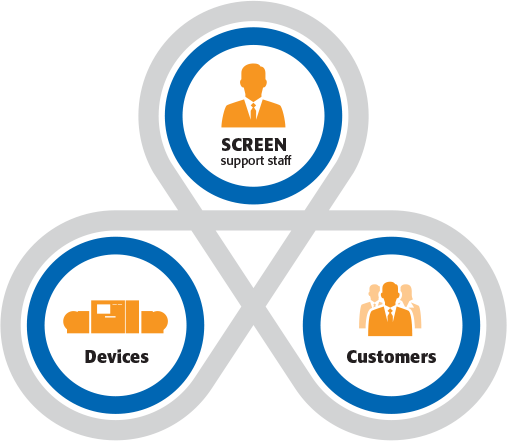 Screen equipment has a reputation for reliability that is second to none and by providing first class service, throughout the EMEA region, Screen ensures that it retains its market leader status with equipment that has the highest up-time and lowest maintenance costs tailored specifically to individual requirements.